Following on from my post in April for the carnival, I was slightly puzzled by the fact that the articles I referred to managed to compile different lists of words 2-year-olds should know even though the seemed to quote the same source. So I thought I'd share my own list(s). 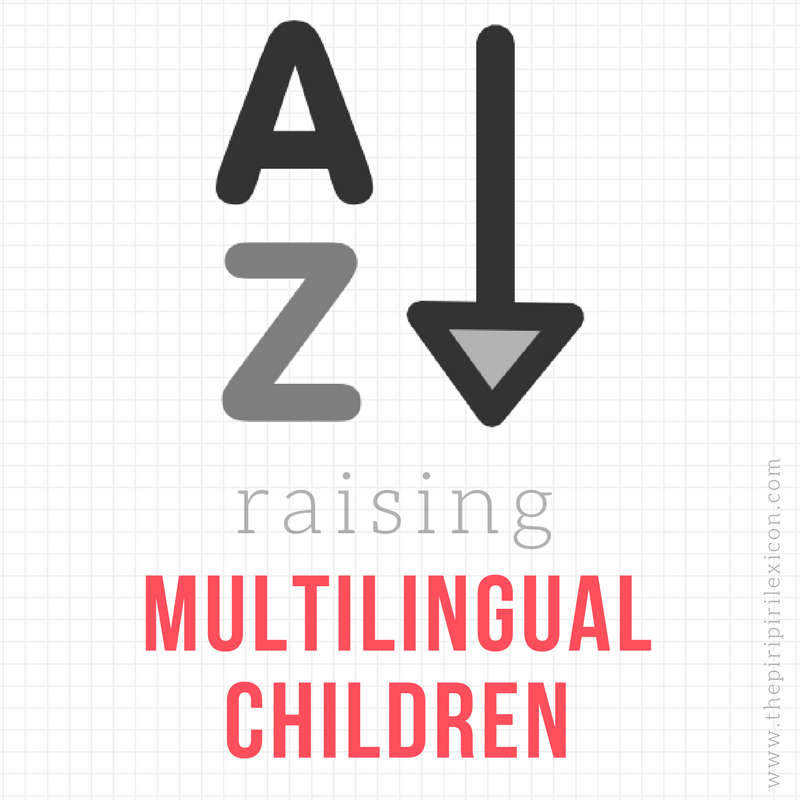 A word of caution: there are no list of words for multilingual children (partly because of the endless language combinations possible). And while bilinguals are not two monolinguals in one on many accounts, it can be a good starting point to find out what monolingual children should say at a given age. Don't forget that if your child only hears English for half of the day, then it is possible s/he may only produce half of those words. 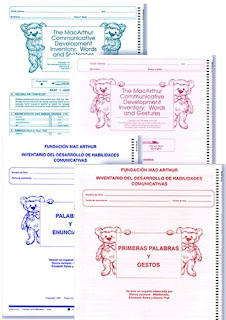 The resource I used to make up this list is based on an assessment tool that parents fill in called the MacArthur Bates Communicative Development Inventories. This is mainly aimed at researchers but is easily understandable. 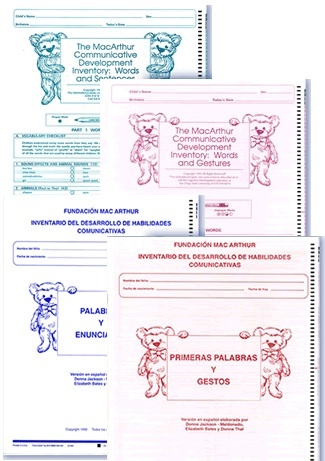 The MacArthur Bates inventories produce tables (you can check them online) of the most frequent words understood and produced by children between 16 and 30 months old. 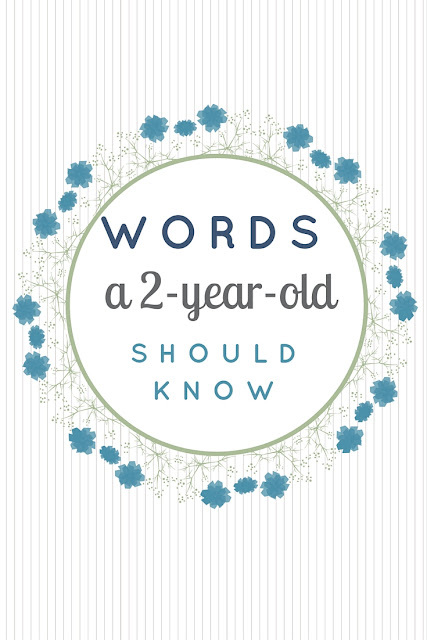 While the articles reported that children should say at least 25 words at 2 years old, there is huge variability in children. 25 is most likely a minimum number and children can produce a lot more by this age (up to 8 times more on average). So I have compiled a list of 50 words: the 50 most frequent words produced by (American) English-speaking children at 2 years old. The table below can be read as thus: 'mommy' is the most frequent word produced by 2 year olds (24 months). It is produced by 99% of children this age. 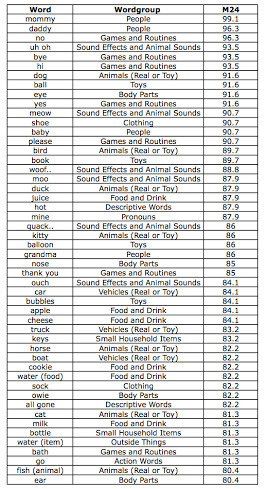 'uh oh' is the fourth most common word (or sound effect) produced by 94% of children. Caution: this is a list for English. Do not try and translate this to any other language as there are cultural and linguistic differences which I will explore in a later post. Source: Dale, P. S., and Fenson, L. (1996). Lexical development norms for young children. Behavioral Research Methods, Instruments, & Computers, 28, 125-127. This is fantastic! Great work Annabelle!